“I think about my novels for a long time before I start to write them—a year or more, sometimes many years. I’m half Swede, and Swedes are brooders. I just sit around brooding about it. A lot of this happens when I’m walking or driving. I’ll take long, directionless car trips to try and see where my mind is. Usually, the story begins with a collection of images. I’ll make a few notes in my journal, but not very much. Often not much more than a vague outline. A tracery, a silhouette. I’m not sure what the connection is between writer Jim Harrison and musician Jimmy Buffett, but I’m pretty sure there is one. Some secret Livingston/Key West handshake. 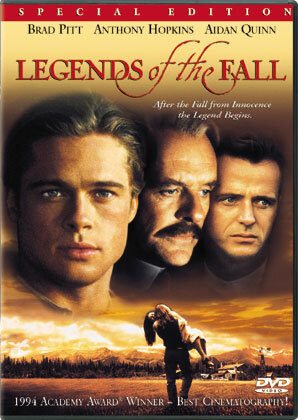 The 1994 movie Legends of the Fall, based on a novella by Harrison, is a movie I watch every couple of years. I don’t know if it’s the scenery where director Edward Zwick (Glory) picked to shoot the film in the beautiful Canadian Rockies. I don’t know if it’s the cinematography that captured that beauty—for which DP John Toll won an Oscar in 1995. I don’t know if it’s the actors—or simply Brad Pitt’s character Tristan or his Lawrence of Arabia/John Wayne–like introduction, or the James Horner music—whatever the reason, I find Legends of the Fall repeatedly enjoyable to watch. Critics were spilt at the time of its release and it’s not hard to see why. It has one foot in being an epic story and one foot in melodrama. Tricky territory. And I think that was by design in an attempt for the movie to gain a large audience of both men and women. Coming off the heals of a Dances with Wolves, Legends of the Falls fell short at the box office & Academy Award-wise compared with Dances (which won Pest Picture and 7 total Oscars and made $184 million domestic). But Legends is the one I return to again and again. Perhaps Legends the film split the vote more than the book did and paid the price. You have wild horses, guns and war for the men and beautiful western clothes, lawn tennis, and a romance normally associated with a romance novel or soap opera for the ladies. And if any men were on the fence, Pitt’s flowing hair (often perfectly backlit) kept them from going over. I’m never surprised when men tell me they’ve never seen the film. Perhaps a sweeping generalization and an oversimplification, but that’s my take. It’s too—to use Harrison’s word—pretty. The movie basically extracts the characters that Harrison created and somewhat places them in a new story. Col. Ludlow (Anthony Hopkins), Alfred (Aidan Quinn), Samuel (Henry Thomas), Tristan (Pitt) and others are all there. Susannah’s role (Julia Ormond) is altered and beefed up. Heck, the book opens with the brothers going to the war where in the movie that doesn’t occur until the 32 minute mark. The book is more Tristan focused and covers more of his far away adventures. Like writer Walter Kirn (who also happens lives in Livingston, Montana where Harrison lives part of the year) said of the movie Up in the Air that was based on his book of the same name—the book is not the movie, and the movie is not the book, but they have the same DNA. In my adventures over the years I have been fortunate to experience such things as witnessing a full solar eclipse in Salzburg, been free diving with large green turtles in Hanauma Bay in Hawaii, and flown in a seaplane over the Amazon River, but one of the most unbelievable and unexpected experiences I’ve ever had is watching thousands of Sandhill Cranes fill the sky on the edge of the Nebraska Sand Hills. To beat the drum once again you don’t need to be in New York and L.A. to find adventures or stories worth telling. Certainly, even a somewhat remote place such as Nebraska has been fertile ground for writers from Harrison (Dalva), to Willa Cather (My Antonia) and screenwriter Alexander Payne (Election, About Schmidt). May you all have eyes to see. Though Jim Harrison’s novella Legends of the Fall is less than 100 pages long and he said he wrote it in about ten days those numbers can be deceptive. In one interview he said it usually takes him about 10 years of thinking about things by the time he finishes writing his novellas. Before Harrison became widely known as the writer of Legends of the Fall (which became a 1994 movie and helped cement Brad Pitt as a movie star) he had long been carving away at his craft in Michigan. It is interesting to note that Ernest Hemingway, Thomas McGuane (Ninety-Two in the Shade) and Harrison all spent time hunting and fishing in the same general northern area of the Lower Peninsula of Michigan. All also came from religious families who put an emphasis on reading as well as an outdoor life. And while they all wrestled with their faith it impacted their writing. All three also gravitated to living at least part of the time in the northern U.S. region of the Rocky Mountains. McGaune and Harrison also attended Michigan State at the same time as did fellow writer Richard Ford. In 2008, Esquire magazine listed The 75 Books Every Man Should Read and placed Legends of the Fall at #23 and Richard Ford’s The Sportswriter #60. Harrison went on to get his M.A. in comparative literature at Michigan State and then struggled to earn a living for well over a decade existing on fellowships, grants and publishing books of poetry while writing in Michigan. In interviews he has said that he never made over $10,000. a year for the first 17 years of his marriage. Then there were some tax problems, some drinking problems, cocaine, depression, followed by suicidal thoughts. After a hunting injury he was encouraged by McGuane to try his hand at writing a novel. The result was Wolf; A False Memoir (1971). A few years later he published A Good Day to Day and that would open the door to Hollywood where Harrison was paid well, but produced little as a screenwriter. He wrote his first screenplay in 1975 for filmmaker Frederick Weisman (though it was unproduced) and worked as a contract screenwriter though 1997. A side benefit was hanging out with people like Orson Welles, John Huston, and Jack Nicholson. He continued writing novels and eventually some of them found their way to getting produced as movies. Sometimes he was credited with working on the script and sometimes other screenwriters were brought in to write the scripts. Harrison’s credits include Dalva, Carried Away, Revenge, and Wolf, along with Legends of the Fall. In 2007, Harrison was elected into the American Academy of the Arts. 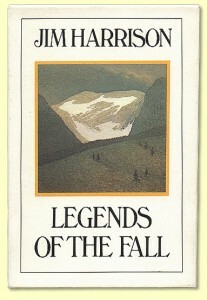 More on Harrison tomorrow and some of his thoughts on the movie Legends of the Fall. *The screenplay for Legends of the Fall was written by Susan Shilliday and William D. Wittliff. “Del Close was the improv comedy guru (both writing and acting) in Chicago when I went there. And he was the reason I went there. I was told about this guy doing groundbreaking work, where you are improvising plays, and he could teach you how to improvise scenes. He was a big influence on my life. I worked with him for a long time. Our improv group became an experimental group. He’d work out forms with us—Ian Roberts, Matt Besser, Rachel Dratch was in the group for a while, Neil Flynn, Miles Stroth. He would use us as his group, and what he taught, looking back on it, a lot of it was about writing. He had certain kinds of things he would push, like: always look for your third thought. Your first instinctual thought was a commonplace one, your second one was kind of respectable, but it was the third one where it got special. So he would have us stand on stage until we found that third thought, and eventually we got pretty fast at it.